A site visit will be undertaken to discuss design ideas, finishes and take measurements for the furniture required or area to be fitted. A Quotation is then supplied and if this is accepted we can then supply a scale drawing, if required, along with swatches of finishes etc. Customers sometimes need a piece of furniture matched to existing items in their home. This can also be achieved. 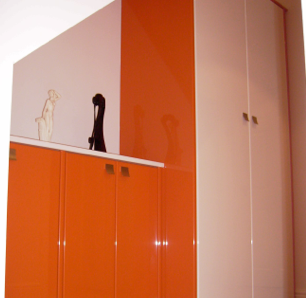 We can provide polyester paint finishes which give a very contemporary look to the piece of furniture. With this process a colour can be matched to any existing furniture or chosen from a colour chart ie: Dulux, Crown etc. Polyester lacquer is a high gloss finish that is polished by hand to give an appearance that no other spray finish can match. Polyester lacquer is extremely versatile, with over 1000 colours including clear it can be applied to all types of wood boards such as ply, mdf, veneered, fire rated also fibre glass, Carbon fibre and Aluminium. Polyester lacquer is suitable for both domestic and commercial use, is resistant to temperature variations, humidity, water and household solvents. Polyester lacquer also conforms to FIRA 6250 rating for severe usage.